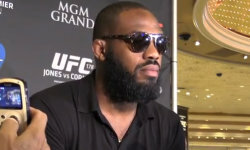 In the wake of Jon Jones’ Fox Sports interview Monday, in which he denied having a cocaine problem, many questioned the UFC light heavyweight champion's sincerity. During the 13-minute one-on-one with Fox Sports Live host Charissa Thompson, Jones admitted to using cocaine at a party prior to the Dec. 4 drug test he failed. He also admitted to using cocaine and other recreational drugs in college, but unequivocally denied having a cocaine problem. "I know I don't [have a problem]," Jones said. "There's no room in my life to be a cocaine addict." It seems as though every fighter, blogger, pundit, and social media soapboxer who has seen the interview, whether they believe or doubt the honesty of Jones, is a self-proclaimed expert on behavior, body language, and deception. Rather than pile on with our own hypothesis of what we feel Jones’ demeanor indicated, we instead brought in two actual leading experts in the field to watch and analyze the 13-minute interview below and share their unbiased expert opinion of how genuine Jones really was. Janine Driver is a former ATF agent and deception and body language training officer, and is the New York Times and international best selling author of "You Can’t Lie to Me". She is the current president of the Body Language Institute, which offers civilian training courses and consults for various law enforcement agencies, legal teams, and news agencies. Our second expert, Patti Wood, holds a master’s degree in interpersonal communication with an emphasis in non-verbal communication. She has given her expert analysis to countless law enforcement agencies and media outlets, including CNN, Fox News, ABC News, The Washington Post, and National Post. “Jon Jones truly does have an on-air, off-air personality and great media coach,” Woods points out. I knew he was fake around the time he started "drinking his own Cool Aid"!! !